On Saturday, April 25th, Charlotte based, Headlines Barber Shop hosted Cuts and a Cause from 10am – 2pm. The event was aimed at raising awareness about lupus. Money was raised through raffle ticket sales. Donations will also be accepted during the event and are a tax write off. Marietta Ingram, member of the NC Lupus Board of Directors will be on site to answer questions. She has a walk team that will be participating in the “Walk to End Lupus Now” event on May 16th at CPCC’s Central Campus. She will be soliciting people to join her walk team, Marietta’s Miracle. She can also assist individuals who would like to create their own walk team. The goal of the event is to raise $2000 to benefit the Lupus Foundation of America’s North Carolina Chapter. Hello, my name is Marietta Ingram. I am 43 years old and I was diagnosed with Systemic Lupus at the age of 29, and this is my story. I’ll never forget the morning I woke up to loss of circulation and throbbing pain in my elbow. I sat there racking my brain, trying to remember what I’d done the day before to cause such an injury. I got ready and went to work as usual, trying to ignore the pain and just assuming I’d somehow pulled a muscle. I decided to make a visit to the doctor. It was diagnosed as “tennis elbow”. I never understood, since I didn’t play tennis. After several trips to the emergency room, and doctor appointments, I was finally referred to a rheumatologist. We started the “testing process”. The fun stuff, lots and lots of blood work to find the underlying cause. After an extensive symptom checklist and the results of my blood work, I was finally diagnosed with Systemic Lupus in February of 2000. Upon hearing my diagnosis, I was confused and scared. I had no idea what Lupus was. The only things that stuck in my memory were “no cure” and “fatal”. Although I was a little relieved to have a diagnosis, everything seemed to make sense then. I’d spent years just struggling to get out of bed. In the past, I wanted to participate in sports or other extracurricular activities so badly, but I was exhausted or in pain. I never really thought anything of it. I just assumed this was “normal” or I was just lazy. My diagnosis came at a good time. It wasn’t long before I began to suffer many “Lupus flare-ups”. Lupus is a chronic autoimmune disease that can damage any part of the body, which cannot tell the difference between foreign invaders and healthy tissues. Lupus attacks cause redness, swelling and pain characterized by flares and remissions. I have two of the major disease forms which is discoid lupus; which affects the skin, and systemic lupus; which affects the internal organs. The flare-ups are wild and unpredictable. Like many people with chronic diseases, especially after the initial diagnosis, I went through a period of depression. It’s hard to describe what it’s like to have lupus. The thing I have to fight most every day is extreme fatigue. Sometimes it’s a real struggle just to get out of bed and get going in the mornings. I like to stay on the go, but I have learned to listen to my body when it’s telling me that it’s time to sit down or lie down and rest. I can’t tell you how many times I’ve been in the hospital or the ER just because of Lupus complications. I’ve had numerous treatments just to manage my Lupus. There were times where I was tired of taking the medication. And because of that, I had a major complication. I had fluid around my heart, and was in the critical care unit for a week. This was a wake-up call for me. Living with Lupus is a daily struggle. Most people think that those with Lupus may not “look” sick, but we are. It’s a daily feeling of having the flu. Feeling like I have the flu is normal to me. Just making it through the day with only one ailment is a good day for me. It’s hard to go through each day feeling what I feel and not wanting to tell anyone. Not wanting to tell anyone because I just want to avoid all the questions. I don’t want people to think “there is always something wrong with her”. The truth is they are right. There is always something wrong with me, but I have learned to live with it. It has become my normalcy. It doesn’t only cause physical pain, but emotional pain as well. It’s frustrating to feel what I feel and have no one understand. I stress about being a burden on my friends and family. I won’t even mention the endless medical bills! I came up with a plan on how I was going to fight and overcome this. I knew I had to strengthen my faith with God and pray more. 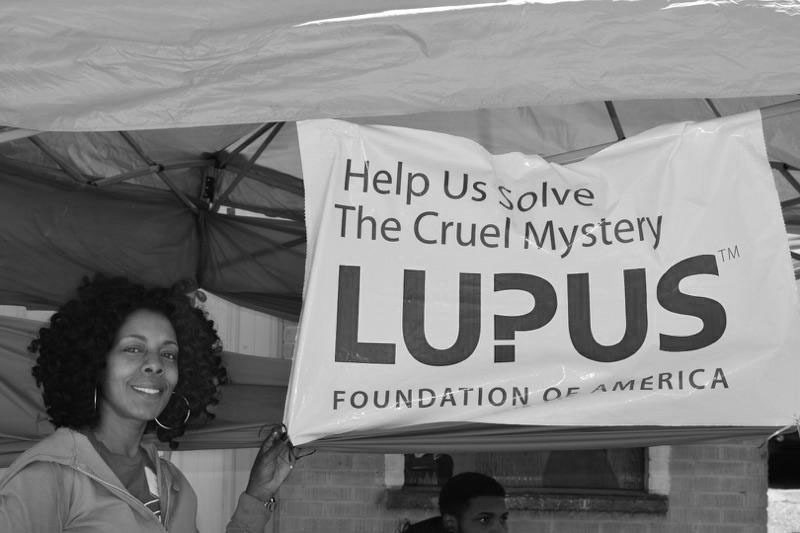 I got involved more with the Local Lupus Foundation Chapter. I was selected to be on the Board of Directors and Chair for the Program and Services Committee. This process gave me the courage to open up to my family and share what I was experiencing. Instead of feeling ashamed like I assumed I would be, I was showered with love and support. I could write an entire book about my 15 year struggle with Lupus. When I was first diagnosed, I was told that the odds used to be 50-50, meaning that you’d die within 5 years of diagnosis. Today there are more tests, better treatments, and a larger percent chance that Lupus will not shorten my life-span! I have made it this far and I will continue!! I may feel like crap and my bad days may be pretty bad, but I will not succumb to it. Sometimes, just by sharing your story, could have a positive impact on someone. I wanted to share my story and maybe it will help heal someone like I was healed.